Enthusiasts of the blue and white mean machines will now be able to take their passion to the PSP with LA Duel. The Ford Racing series have been popular on the PS2 in the past unless you are a Holden fan of course! Taking to the fast streets of Los Angeles players can work with their teams with a whole league of licensed real life vehicles that look great and race great as well. As with the previous Ford games, the thing that sets it apart from the rest of the pack is the fact that you control two vehicles during the race, with AI helping out somewhat. You get to swap between the cars and act as though the two cars are working as a team and pin away your opposition. Either car wins and you win! Everyone wins! During the game you can get access to more and more cars till eventually you should have about 21 cars that sit proudly in your garage to take out and race. As you move through the game you can buy and sell these vehicles if you need as you will have to repair and upgrade cars as you race and damage them. That’s right, Ford have actually had the courage to allow in game damage to their vehicles which is a pretty refreshing move compared to some other games. Graphically, this is a really tidy game with a lot of the great work being done already in the PS2 iterations of the game, so the PSP really benefits from the groundwork already undertaken. 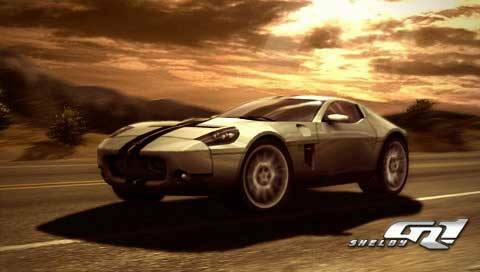 Cars look like their real life counterparts and the tracks are given a ton of attention so gamers should not have any problems with getting in and playing to their hearts content. This is a racer that fans will get into and casual gamers will enjoy. Whilst it still has a way to go before catching up with your Gran Turismo titles et al, this is still a solid game. It would have benefited from a more rocking soundtrack.